Now that my youngest daughter has hit the teenage years, there are very few things that will get her out of bed on the weekends before noon and still have her be in a good mood. Fortunately, I have these cinnamon rolls to help coax her to the breakfast table. 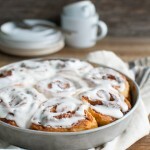 The smell of cinnamon-sugar wafting in the air as you pull these cinnamon rolls fresh and hot from the oven are enough to get even the grumpiest teen out of bed. Add a generous spread of buttermilk icing and who can resist. The problem with most cinnamon roll recipes is that they use a yeast dough that requires a couple of hours of rising time. I may not want to sleep in until noon but I have never been motivated enough to get up two hours early to start a yeast dough and then wait for an hour while it rises, then knead it, shape it, and let it rise again. I love my kids and all but I love my sleep too. That’s where these quick cinnamon rolls come in. They are still made from scratch but use a quick dough of buttermilk and baking powder for leaveners. No rising time needed here. You can have these cinnamon rolls on the table in less than an hour. And don’t think that texture is being sacrificed for convenience in this recipe. These quick cinnamon rolls will rival any yeast dough cinnamon rolls for melt in your mouth tenderness. In fact, I recently served these to some friends of my older daughter who claimed them to be the best cinnamon rolls they ever had. I have found this recipe to be extremely forgiving. Even when I don’t get the dough and filling tightly rolled up (which is often) and the rolls are misshapen and in less than perfect spirals, they still bake up tender and tasty. Not to mention, the icing hides many flaws. Note that the recipe calls for a total of eight tablespoons of melted butter for the filling, dough, and pan. It is easiest if you melt the entire amount in the beginning and measure it out as you need it. Also, note that the six tablespoons of butter used in the dough are divided as well. Two tablespoons are mixed into the dough, another two tablespoons are brushed on the rolled out dough, and the final two tablespoons are brushed on the rolls before baking. I have come close many times to accidentally adding all six tablespoons of butter into the dough so I wanted to give you a heads-up. Now, let’s talk about the buttermilk icing. In my book, no cinnamon roll is complete without a generous amount of gooey icing. Buttermilk isn’t usually used in icing but it is what makes this icing go beyond expectations – it adds a little tang to balance all the sweetness. I have tried substituting regular milk for the buttermilk and the results weren’t nearly as good. A quick shout-out to my mother-in-law who gave me the super cute butter knife with the name of my blog stamped on it for Christmas. It’s great for spreading icing on cinnamon rolls and makes me smile every time I use it. Heat oven to 425 degrees. Pour 1 tablespoon melted butter into a 9-inch cake pan; brush to evenly coat the bottom and side of pan. Stir the brown sugar, granulated sugar, cinnamon, cloves, and salt together in a small bowl with a fork until evenly mixed. Add 1 tablespoon melted butter and stir until mixture resembles wet sand and butter is evenly mixed in; set aside. Whisk together flour, sugar, baking powder, baking soda, and salt in a large bowl. Whisk buttermilk and 2 tablespoons melted butter in a glass measuring cup or small bowl until combined. Add buttermilk mixture to dry ingredients and stir with wooden spoon or rubber spatula until liquid is absorbed and dough starts to come together. With floured hands, lightly knead the dough together in the bowl until just smooth and no longer shaggy. Transfer dough to lightly floured work surface and pat dough with floured hands into a 12 by 9-inch rectangle. Brush dough with 2 tablespoons melted butter. Sprinkle evenly with cinnamon-sugar filling, leaving 1/2-inch border of plain dough around edges. Press filling firmly into dough to help it stay in place. Using bench scraper or metal spatula, loosen dough from work surface. Starting at long side, roll dough, pressing lightly, to form tight log. Pinch seam to seal. Roll log seam-side down and cut crosswise evenly into eight pieces. Slightly flatten each piece of dough with your hand to seal open edges and keep filling in place. Place one roll in center of prepared pan, then place remaining seven rolls around perimeter of pan. Brush with 2 tablespoons remaining melted butter. Bake until edges are golden brown, 23 to 25 minutes. Cool rolls in pan for 5-10 minutes before icing. While rolls are cooling, whisk cream cheese and buttermilk in medium bowl until thick and smooth. The mixture will look like cottage cheese at first but will smooth out as you whisk it. Add confectioner’s sugar and continue whisking until smooth glaze forms. Spread glaze evenly over the rolls and serve. Note that the recipe calls for a total of eight tablespoons of melted butter for the filling, dough, and pan. It is easiest if you melt the entire amount in the beginning and measure it out as you need it. Also, note that the six tablespoons of butter used in the dough are divided as well. Two tablespoons are mixed into the dough, another two tablespoons are brushed on the rolled out dough, and the final two tablespoons are brushed on the rolls before baking. For a prettier presentation, you can invert the rolls on to a plate and then invert the rolls again on to a serving platter (after they have cooled slightly in the pan but before you spread icing on the rolls).